V with her programme and de rigour flashing tat! I can’t believe that on the way back from Peppa Pig’s Big Splash show we actually had a serious conversation about the criterion for judging a world record muddy puddle jump are – velocity or height of splash – or both – and how is it measured?! But, plot nit-picking by adults aside, the latest offering from the team that brought us Peppa’s Big Party and Treasure Hunt is another winner in the eyes of these parents because most importantly, a 3.5-year-old thoroughly enjoyed herself! 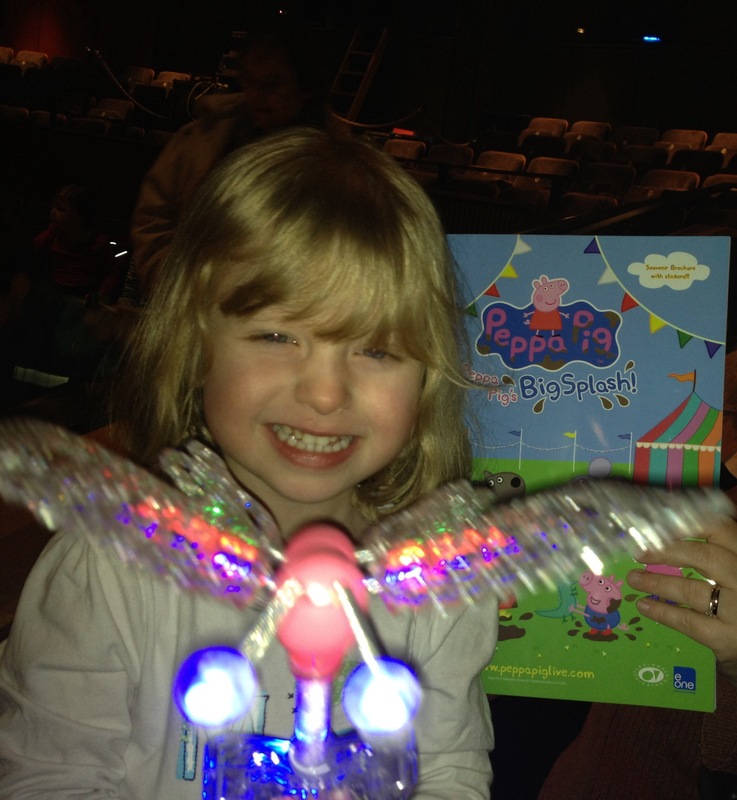 I can’t think which TV character of my youth I would have enjoyed seeing on stage as much as the young audience at the Grove loved Peppa – maybe a Womble – but the phenomenon that is the little pink pig kept them excited and enthralled throughout. The main plot in the story is that the nursery roof is leaking so the characters hold a playgroup fete to raise money. But before they get to that bit, there is recognisable fun for the young fans of the TV show, as favourite characters Peppa and her brother George, Mummy and Daddy Pig, Suzy Sheep, Danny Dog and Pedro Pony indulge in games such as hide and seek and piggy in the middle and George of course, at some point, manages to lose his favourite dinosaur toy. He, of course, cries and here it’s worth warning people that if they book seats in the first few rows they should expect to get a bit wet. And if they don’t at this point – then just wait for the muddy puddle jumping! The TV characters are all depicted by puppets skillfully worked by actors who make them believable. They are escorted by “Daisy”, a friend of Peppa, who drives the action and instructs the audience. The show includes lots of audience interaction, shouting out and jumping up and down, and regular sing-a-long songs, including two from Treasure Hunt and my personal favourite from the TV show – the Bing Bong Song – which I am still singing! The fete in the second half is quite surreal at times, especially when it’s opened by Mr Potato who then goes onto join the fruit on the stalls (which suddenly come to life) in a calypso style song accompanied by a large singing carrot in a grass skirt. Suspension of disbelief required for adults. Normal fayre for young Peppa fans! The climax of the show is a muddy puddle jumping competition, judged (how? I still don’t know!) by Mr Potato and if you don’t want to know the ending don’t read on. V was very concerned at the result – not because Daddy Pig lost his world record puddle jump, not because Mr Bull beat it, but because Peppa cheated. Yes – her little pink hero won the record back by getting the audience to join in and that – dear audience – is “not fair” according to a 3.5-year-old! But she soon forgot about it at the sight of helium balloons in the foyer afterwards and to be honest hasn’t mentioned that bit since so Peppa had not gone down in her estimations far enough to distract her from more merchandise! Branded character shows can sometimes be disappointing where companies think children will be happy just seeing the characters on the stage dancing about a bit. The Peppa shows respect the fact that youngsters can, and indeed want to, engage with a proper story and really get involved with the action. I liked the way George burst out his tears and I liked the bit when you got wet. I liked the talking fruit especially the skirt on the carrot. I liked Peppa Pig and the big splash with Peppa’s dad and the Muddy Puddles song. Age range: Anyone who enjoys Peppa really! Running time: About 80 mins – approx 30 mins per half plus a 20 min interval. Merchandise was quite pricey but if you want to get something, I would go for the souvenir brochure / activity book. It’s a fiver, which is not much dearer than a pre-school children’s comic these days and it is very good quality. The spinning windmill lights were £7.00 which seems to be the norm these days. We got talked into getting one yet again but on the proviso she use it all the way through panto season as well! Although all bets are off on what flashing tat we end up with at Cinderella! Otherwise there are T-shirts, ruck sacks, umbrellas, soft character toys, scarves and gloves. Be warned – when you come out of the show there are helium balloons on offer which always bring with them a demand from V.
This time it was a request deftly and proudly swerved by us – but if you think your little one will really want one, save some cash for after the show! This sounds like so much fun – and I laughed at your serious discussion about judging the splashes!